number close to edge of the table and far apart enough for people to stand by their numbers. 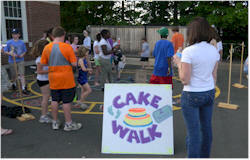 We have approximately 30-40 people show up most of the time for a cake walk. You charge them .50 per number (usually we charge .25 because of the size of the crowd). They can buy as many numbers at once as they want. They stand by their numbers. You have a second copy of the numbers that are on the tables in a bag. Once the numbers on the tables have all been sold, ( if all the numbers are not sold you just flip each one over until the next draw, and if one of those unsold numbers should be drawn, just draw another number) then you draw the number and the person who bought that number is the person who wins a cake.